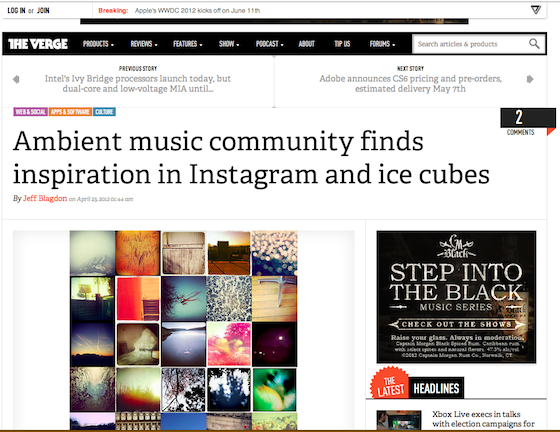 The Disquiet-commissioned projects Junto, LX(RMX), and Instagr/am/bient got some great attention this past weekend when both createdigitalmusic.com and theverge.com covered them. For communities of creative individuals, working under shared constraints can result in some incredible work, showing off what artists can put together with a limited set of tools. A great example is the “beat battle,” in which competing musicians are all given the same sample and compete to build the best instrumental track out of it. 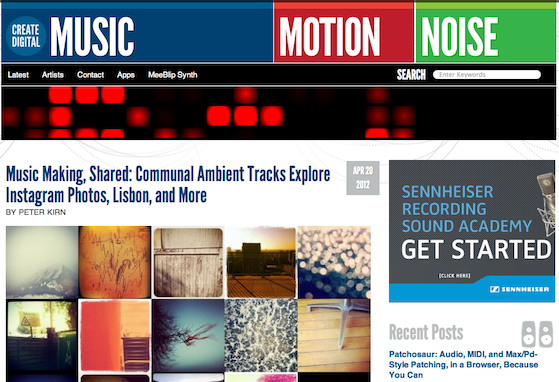 Part of what is rewarding about these two stories is that they come from beyond the realm of publications that are focused solely on music as end-product. Much of CDM’s coverage is on the technology of music-making, and the Verge is pretty squarely in the gadget-journalism category. Between the two articles, an additional approximately 5,000 listens were registered at soundcloud.com/disquiet in the 48 hours or so after the posts appeared, and the Disquiet Junto had almost half a dozen new participants, bringing the total to 170 as of project 16.